A NIGHT OF CREAM – ADELAIDE SONGS THE DIRECTOR’S CUT – BELLY OF A DRUNKEN PIANO -ROCK ORCHESTRA UNDER THE STARS. Imitating the individual virtuosity of Eric Clapton, Ginger Baker and Jack Bruce and their collective brilliance as Cream was always going to be a hard task. In their tribute show, A Night of Cream, local band Somnium made a stalwart attempt. Opening with an old recording of a BBC news story about Cream’s legendary 1968 Albert Hall gigs, they delivered flawless versions of Strange Brew, Badge and I Feel Free before losing some momentum with some blues songs. This did not deter the all age and enthusiastic audience at Chateau Apollo from getting up to dance once the band returned to the more familiar favourites Sunshine of Your Love and White Room. The band admitted that learning the songs had stretched and improved their musicality. No real surprise there, given that Cream were the first ever supergroup, and named as such to boot. In these days when music is so commoditised, it is timely to remember the free form improvisation and on stage telepathy that was the foundation early rock, and encouraging that young musicians are rediscovering our collective musical heritage. Cue forward to current original music, but back a century or so. Adelaide Songs Director’s Cut, at The Jade, is the latest version of a songwriting project celebrating the history of South Australia. From the singalong Colonel Light (he got it right) to the more reflective Holden Boys Don’t Cry, commemorating the city’s now historical motor industry, no stone is left unturned. Combining satire and social commentary this multi-vocalist, multi-instrumental production serves up music best described as whimsical with a touch of folk. But it’s all about the lyrics as historical and political figures are either sent up as in Battery Powered Priemier or sanctified (as for much loved former premier Don Dunstan) in Politics of Love. Taking heaps of history, a dash of nostalgia and a pinch of hilarity Adelaide Songs offers time to reflect, in a not too serious way, on our city’s identity, past, present and future. Hole and The Piano Has Been Drinking (not me). The show, however, was not a straight tribute, as it featured several of D’Arrietta’s own original songs. This may have been a source of disappointment for the mainly mature audience wanting to hear more of their musical hero despite how good D’Arrietta and Band were. Indeed the cigarette-and-whisky-honed voice and piano chops were perfect, with an imposing stage presence to match, and a tight band. Don’t get me wrong, I loved the show, it’s just not quite what was advertised. Finally, in a busy week, a show which was exactly as advertised. Rock Orchestra Under the Stars is the brainchild of two stalwarts of the Adelaide music scene: guitarist Ben Whittington and bassist Eugene (“Yooj”) Russo. 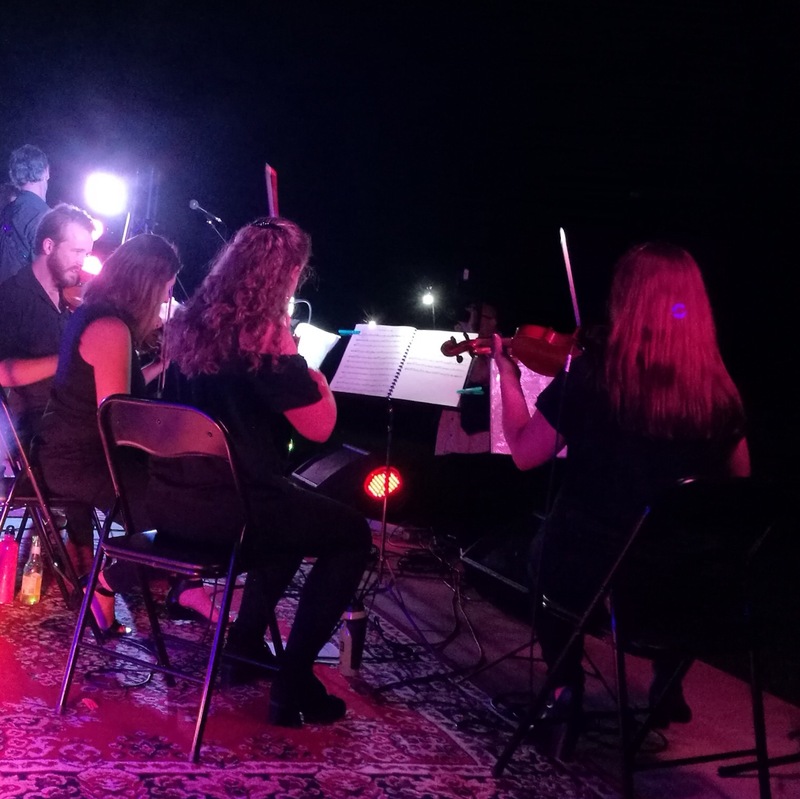 With a string section, flute, saxophone, percussion and backing singers as well as an electric band, the ensemble delivered gutsy renditions of many rock classics from the Fo o Fighters, Metallica, David Bowie, Whitesnake and more, with the Goo Goo Dolls’ Iris one of many highlights. The venue, the Museum Lawn in the Adelaide Botanic Gardens was idyllic, if hard to find (we had to scale walls to break into and out of the venue – although I’m sure there was an official entrance somewhere). With perfect weather as the sun set, the crowd picnicked under the stars. Ben and Yooj took most of the lead vocals and, knowing this duo, I was pleasantly surprised at how strong a rock voice Russo possesses (I was previously aware of Ben’s skills). With the light fading, an impromptu athletics show from some cartwheeling kids only added to the fun and enjoyment. Where else would you rather be? INDIGO’S PIANOLYMPICS – CHOIR OF MAN – DAVE AND MIKE DO CASH AND DYLAN – LORD OF THE STRINGS! RETURNS. ALBERT EINSTEIN: RELATIVITIVELY SPEAKING-A HISTORY OF EARLY BLUES-BEST OF EDINBURGH CABARET.